On Monday, November 23, 2009 a group of individuals, who are leaders in the title loan industry, hosted a private fundraiser-reception for Senator Richard Shelby, the Senior Senator from Alabama. The event was led by Roy Hutcheson (Title Cash), Robert Reich (AARAL and Community Loans) and John Robinson (AARAL and TitleMax). Although these key leaders led the charge, the event was a total team effort that included many other industry leaders and participants from around the southeast. Click here to see the full list below. You can also click here for a photo tour of the event. 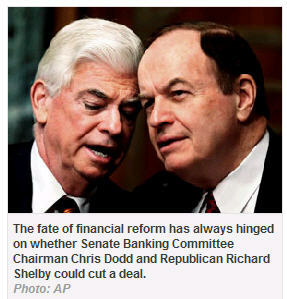 Senator Shelby is not just "any" Senator. He serves on the Committee on Banking, Housing, and Urban Affairs and is the Ranking Member of that critically important committee. That committee will decide the ultimate fate of the Consumer Financial Protection Agency (CFPA) bill now under consideration in Congress. The CFPA is being touted by many “consumer advocates” as a vehicle to put title lenders and other short-term lenders out of business and deprive millions of consumers access to timely and affordable credit options we now provide. There is potentially no single individual in the U.S. Congress that might impact this legislation more than Senator Shelby. Click here to read this article published recently in the New York Times. Do not expect this legislation to die. Our voices have never been more important! The Senator is an incredible person and everyone who attended the event came away thoroughly impressed. Considering today's crop of most political leaders, that is quite bold statement. He met and spoke with the group for over an hour and discussed many issues that effect our lives and our business from a national political perspective. In particular, the Senator is clearly a "business friendly" leader and an ardent believer in the free market. He adamantly opposes the CFPA bill (Financial Czar bill) that is making its way through the U.S. Congress. The members of the group had an opportunity to explain the services the industry provides during the meeting and the Senator expressed his firm belief that we would not exist if there was not a market need for what we do. Needless to say, his beliefs reflect the views held by most all of our members. The CFPA bill will most likely continue to work its way through the U.S. Congress and it is possible some version may pass. It is a comprehensive bill that effects the entire consumer credit industry and has the potential to wreak havoc in our economy and in our industry. Although it is quite possible a bill will pass, it is our view that the likelihood it will include "industry killing" provisions that were part of the original Obama administrations plan are somewhat reduced. Clearly, much work needs to be done to prevent this devastating legislation, but it is not a forgone conclusion it will be passed as originally proposed. These events do not happen "spontaneously." A significant amount of hard work and contributions were made by many to make this critical event possible. 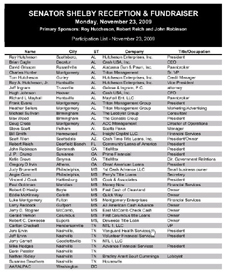 Click on the image to the right for a list of the industry leaders and the many others who made this event possible by donating their time and financial support. If your name is not on the list, there will be other opportunities for you in the future. In the meantime, be sure you express your thanks to those who made this critical event possible and be very thankful we had this opportunity at such a critical time for our industry.